Life in the Carpool Lane: I respect my mama...and you do too! Thank you to everyone who participated in my Earth Week posts. I was truly moved that you came back over and over again to learn a few ways my family respects Mama Earth. And I loved hearing about the things your family is doing too. And let me say that I was really moved, moved to tears even, that everyone 'got it.' I heard from many of my blog friends that are starting to use reusable bags, buying compost pails and bins, getting more diligent about recycling. I truly was blown away. A special "thank you" to ecostore USA and snackTAXI for generously donating their amazing Earth-friendly products to my 'get green' giveaway. It's companies like these that make going green so easy. I wish I had an amazing runner-up prize I could hand out to everyone else who participated in my green posts. The best I can do is to bestow a world-renowned and prestigious award upon those that contributed to making my Earth Week so amazing. I'd like to present the following readers with the "I Respect My Mama" Award for showing some respect to Mother Earth. Laura at Hey What's for Dinner Mom? Lindsay at The Musings of the Mrs. It's very possible with the great number of responses I got on my Earth Week posts that I overlooked someone. 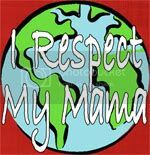 If you left me a comment on my green posts or are actively doing something green in your life, feel free to grab the "I Respect My Mama" award. Thank you for making Earth Week so amazing for me! Note to self: Don't give awards to so many bloggers! I have to contact all of them tonight! Also, for my next giveaway, don't make the entry process so complicated that I need to make a spreadsheet to determine the winner! I love Mama too! I must say I'm having hard time with some things since we moved. This is a tiny town and there is NO recycling. We had been doing glass, plastic, newspaper, cans,etc and now... nothing. It drives me crazy to through a milk jug away! I don't know what to do about it though. thanks for making us all aware and thinking more of mama! I have so much love for you and your family Carey! Thanks so much for this award and thinking of me. Thanks even more for blogging about something so important. Our Mother Earth is so important to our existence. Our kids depend on how we leave her. AWww!! How sweet to pass out the award to us "losers!" Just kidding!! Congrats to Mimi!!! And thank you for all those tips, Carey! Thanks for giving that wonderful award. But I don't know what to do with the code.Please comment in my blog about it. Mimi from He & Me + 3 is a great blogger & really fun to shop with I found out, too! Congrats to her & thanks for the award, I left you one on my blog, Screamging Mimi! That's so very nice of you! We all could do better and most of us are trying in some way or another. Thank you for the award! HAve a blessed day. Thanks for collecting these great mama earth ideas! And thanks for the award! Not there yet. But I did go out last month and buy cloth napkins and I stopped buying paper plates and cups about a year ago. All these baby steps are allowing me to make big strides. I also make my own window cleaner. I am so excited to get all my cool stuff. Yay! thanks for taking the time to thank all of us :) You are a dedicated friend! Umm...no toilet paper? May I ask how you go about doing that? LOL! I guess I have a long way to go to get to that point! But thanks to you, Carey, I am much more aware of what I can do to protect our Mama! Thanks again!!! You would be so proud of my mom, she's very, very, very earth friendly, and she teaches me so much about it. I never thought about buying gently used clothing as an earth friendly thing, we've done it since the kids were born, simply because it allows us more variety, less cost, and it's fun. We make an exception once in a while (Jillian's new dress in February, for example), but those exceptions are rare. The other one we do is to turn the car/van off when in a drive through. We're at the point now where we just avoid drive through places. We took the city bus for years too, and so did my mom. Our schedules don't allow for it right now, but we carpool instead. Can't wait to move to California where we can make use of Solar Power. We can't here, for every hour of sun you get there, we get overcast, rainy, non-sunny weather. LOVE my award badge, I'm wearing it proudly!! Thank you for such a lovely and important award! I'm honored. Thank you so much Carey, you had some really awesome advice and I've been trying my best to do good! My current goal is to get enough reusable bags to stop using any plastic at all. I'm excited about that! I always use the newspaper ads (cause I don't have the paper delivered) to clean the windows & mirrors. I wouldn't use anything else. We don't ever buy paper towels or napkins. What a waste! I, out of respect for my momma, hung two clothes lines in the back yard last weekend and I LOVE THEM!! There is something about line drying that makes me happy. Thanks for the award. I shall proudly display it on my sidebar. Thanks for the award! I loved reading all your tips and I'm proud to say that I have used my reusable bags ever since! Yay me! Thank you so much for the AWARD, You Rock!!! What a cool award! You're awesome! Wonderful effort toward helping people see the importance of "going green" and the giveaway is a wonderful ides Carey, you come up with some grest blogs yourself. ps. I don't think we are ready to NOT use toilet paper either! LOL!! Oooh - thanks for the shout out via green award. Go green! I just need to figure out how to be a bit more green in my life. Right now Ro is looking a little Green. Thanks for caring and sharing. Thanks for the award! Pretty cool. it might be good to mention that the little bags that food comes in is like cheese. not something like meat that could have bacteria or something on it! Okay, normally I would delete the above comment but it is just too funny! So I'm going to leave it. Thank you for the award, very sweet of you to give to everyone! Thanks a bundle for all the great and wonderful tips on how to respect our Mother Earth. You've really opened my eyes and introduced me to new ways to help reduce and eliminate waste. I appreciate you spreading the much needed awareness. Rock on with your bad self!